invited me and helped my show happen! Thanks a lot to Erwin,Evelyne, and Monika who also helped me so much!! I really appreciate all of YOU!! Thanks also to those of YOU who came to see the show!! Thanks to those of YOU who left the kind comments in my guest book as well!! I was so happy to communicate with all of YOU thorough my photography! 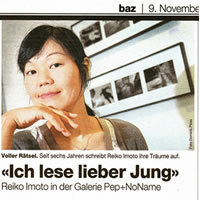 I really liked Basel and all the lovely people! It is a city with lots of nature and good energy! It’s a really beautiful city! 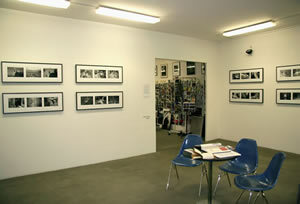 The PEP+NO NAME gallery has a great art /photography book shop as well, if you ever plan to go to Basel in the future, you must check out the gallery / book shop! I would like to go back to Basel next year as well!! Well, I’m well in Brussels right now, and I hope to concentrate more on creating my photography / art in the next year…by staying in the city! My next show will be in Wroclaw, Poland in April, 2007, then inKatowitz , Poland after that. My monograph catalogue is planned to be published next spring! I will update the details later on! I hope that YOU all are well, and preparing for next year! Please take care and keep warm! This entry was posted in 未分類 on Friday December 8th, 2006 by admin.